There is nothing like a hot melted brie topped with the warm savory Gourmet du Village Sun Dried Tomato & Pesto Baked Brie. Preheat oven to 350 degrees. Two ways to prepare the cheese, score the rind with half a knife or remove top rind of cheese, leaving rind on sides and bottom intact. 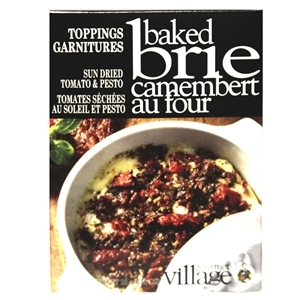 Place cheese cut side up, in a brie baker or baking dish. Put half of the contents of toppings pouch in a small bowl, add the liquid and mix. Spread the prepared topping evenly over the top of the cheese. Place brie baker, without lid in venter of hot oven for 15-20 minutes. Remove and serve with a sliced baguette. Herbs & spices, sun dried tomato (sulphites), onion, tomato, garlic, lemon peel, citric acid. Low sodium.